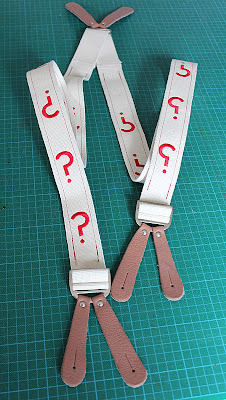 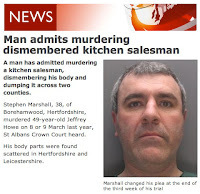 It all puts me in mind of a grisly murder a couple of years back where the dismembered body parts of the victim were found scattered across two counties! Imagine my horror when it emerged the killer had lived barely a dozen streets from where I live in Borehamwood! So the eBay listings for firstly chunks of the mask of a Silurian from Warriors Of The Deep, then later its arm and then a LEG made me think of that terrible crime. 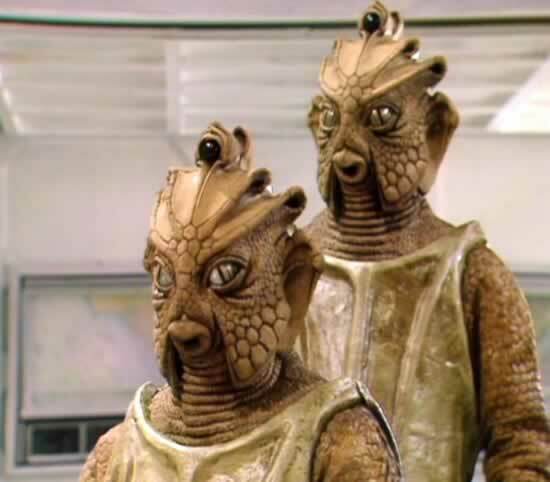 Any props from the original series of Dr Who are rare, those from actual creatures are even rarer. This is a piece from the 1984 story starring Peter Davison - Warriors of the Deep. These fantastic creatures are iconic and this is fondly remembered as the only time they returned in the original run of the series, 14 years after their first appearance. 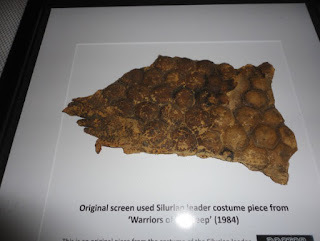 This is an original piece from the costume of the Silurian leader from the famous episode which saw the return of these creatures, first seen in 1970. 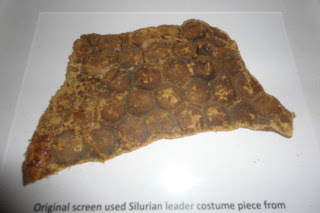 This is from the costume of their leader. 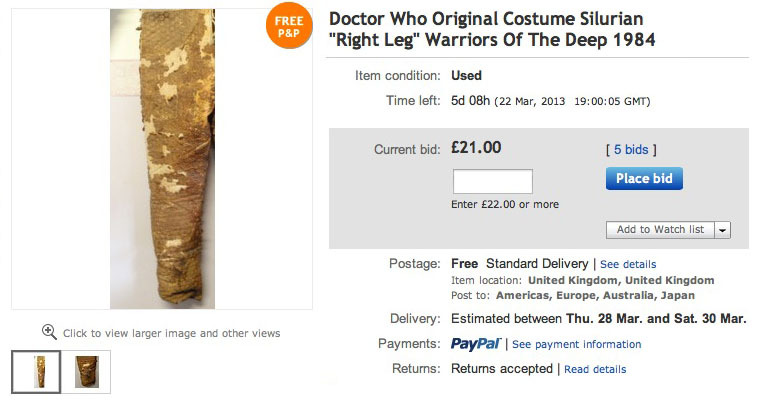 This costume was purchased in a Bonham's auction in 1991. The body was made from scales attached to a boiler suite, however the original costume has deteriorated greatly due to this crude design. 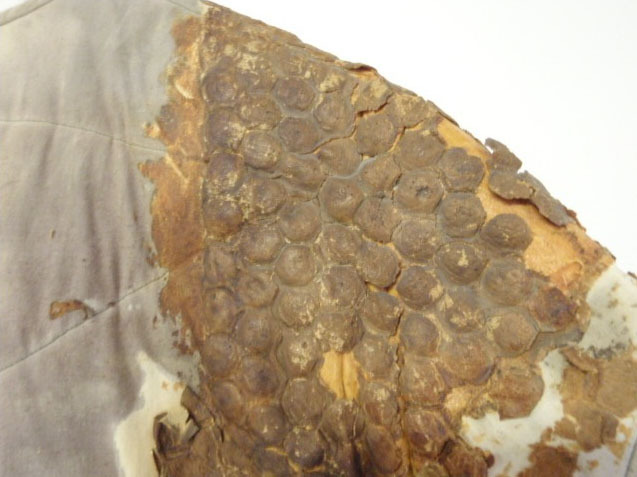 This highly detailed piece was from the left leg and was worn on the skin directly and as such was made with much more detail and has survived in perfect condition. 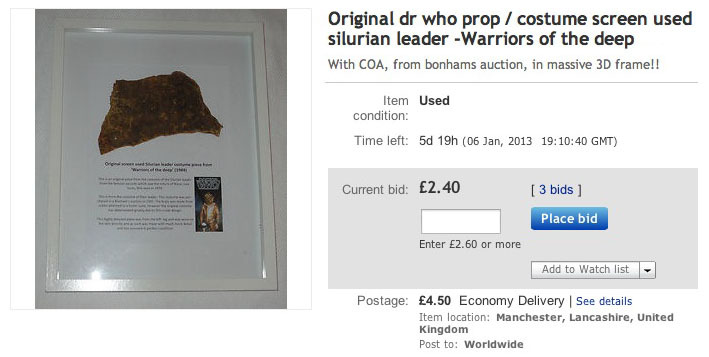 This piece is presented in a massive 14 x 10 inch 3D display frame and come with a certifcate of authenticity from the doctor who prop experts from whom I bought the costume, who got them from the Bonhams BBC auction. This highly detailed piece was from the leg and was worn on the skin directly and as such was made with much more detail and has survived in perfect condition. 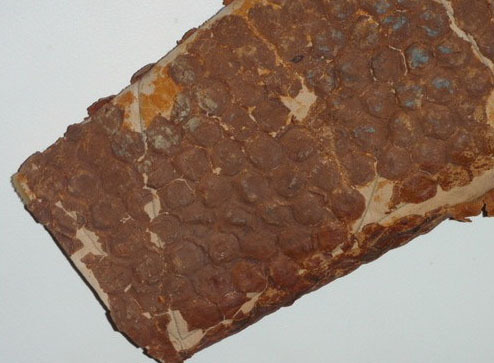 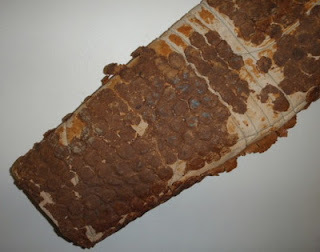 You are bidding on part of a original Silurian costume ie the "Right leg".This was part of the Silurian body suit worn on-screen by Norman Comer playing the lead role of Ichtar in the 1984 Doctor Who story Warriors Of The Deep. Leg measures approx 40 inches long. 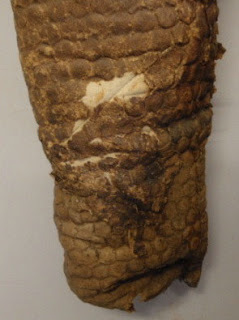 This is an amazing piece and is in its original condition,the arm has lost some reptilian latex skin. 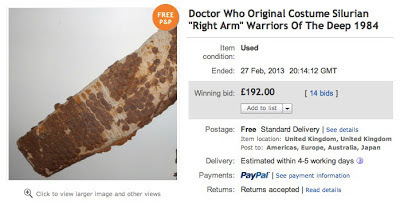 You are bidding on part of a original Silurian costume ie the front part of the left Arm and Chest,but not the back part of the costume.This was part of the Silurian body suit worn on-screen by Norman Comer playing the lead role of Ichtar in the 1984 Doctor Who story Warriors Of The Deep. 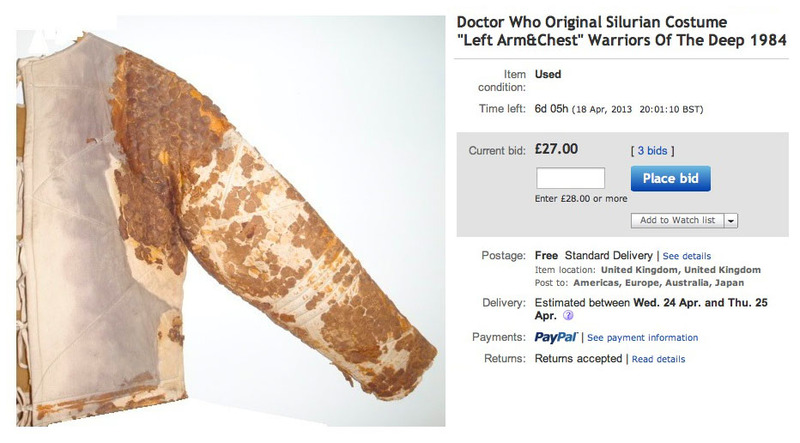 This Silurian left arm and chest is part of the Silurian body suit sold in Bonhams Doctor Who sale in 1991. 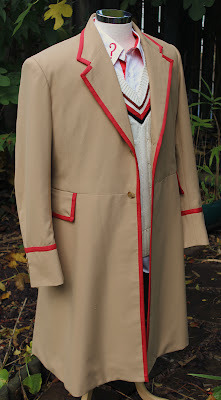 The costume had the name of the actor "Norman Comer" written in which is the name of the leader ichta.